This is becoming like déjà vu all over again for the Blue Valley Tiger football team. On Friday night, the Tigers eliminated the Bishop Miege Stags on their home field 24-21 from the Kansas Class 5A quarterfinal round of the playoffs. It sends Blue Valley, 10-1, into the semifinals next week to play Gardner-Edgerton for the second consecutive year. Funny thing, this was the identical score from week four when these two Eastern Kansas League rivals met, and this game, in several ways mirrored that one. Only Friday night’s game had a lot more on the line. It didn’t take Blue Valley long to strike. 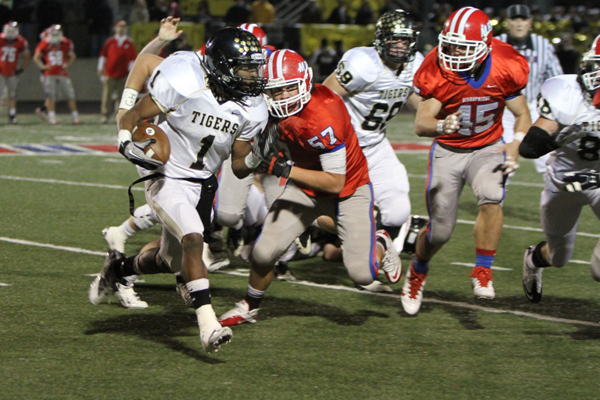 After holding Miege’s potent offense on the opening drive of the game, the Tigers took over on their own 43-yard line. On the first play from scrimmage, Kyle Zimmerman launched a 57-yard bomb to Sean Skaggs for a touchdown. Well, it didn’t take the Stags, 9-2, long to answer. On the ensuing drive’s first play from scrimmage, running back Quanzee Johnson dashed down the sideline 80 yards for the score. In a matter of 13 seconds, the score was tied 7-7. Tigers’ running back Justin Fulks scored on a six-yard run, and placekicker Austin Johnson drilled a 20-yard field goal. Montel Cozart hit Tre Parmalee on a five-yard out pattern, and when the dust had finally settled, Blue Valley led 17-14 at the break. Fulks added another touchdown in the third quarter on a seven-yard run, but in the fourth quarter is when things got interesting. With just under five minutes to play in the game, the Stags got the ball on their own eight-yard line down 24-14. A 40-yard pass to Parmalee and a 28-yarder to McKinley Johnson helped set up a first and goal from the three. Cozart punched it in, and the Stags were down by just three with 3:07 to play. With more than three minutes on the clock and all three of their timeouts remaining, the Stags opted to go for the onside kick. It went out of bounds, and the Tigers were able to set up shop at their own 46. After a quick three and out and a punt held up by the wind, Miege took over at its own 32 with 2:07 to play. First play was a 35-yard sideline pattern to Parmalee. The next two plays were incomplete passes. On third and 10, Cozart was sacked for a 7-yard loss. On fourth and 17 Cozart hit McKinley Johnson on a crossing pattern. He lunged for the first down, and it was close enough to measure. He came up just a yard short, and Bishop Miege’s season was over. The Blue Valley side of the bleachers erupted in celebration, while silence fell over the Miege fans. Defense is what ultimately won this game for the Tigers. Although the stats may not bear it out, the Blue Valley defense was able to keep Parmalee and Cozart frustrated all night long. “We just hoped to contain them, because their big play guys are hard to stop, but it worked out in our favor, just barely, but it worked out,” said senior linebacker Cole Foster.